Refining is carried out either on batch operation or as continuous operation. With certain oils even physical refining can be carried out instead of chemical. For processing less than thirty tones of oil per 24 hours, and when oil has F.F.A. content of 3 % or less normally batch process is recommended. 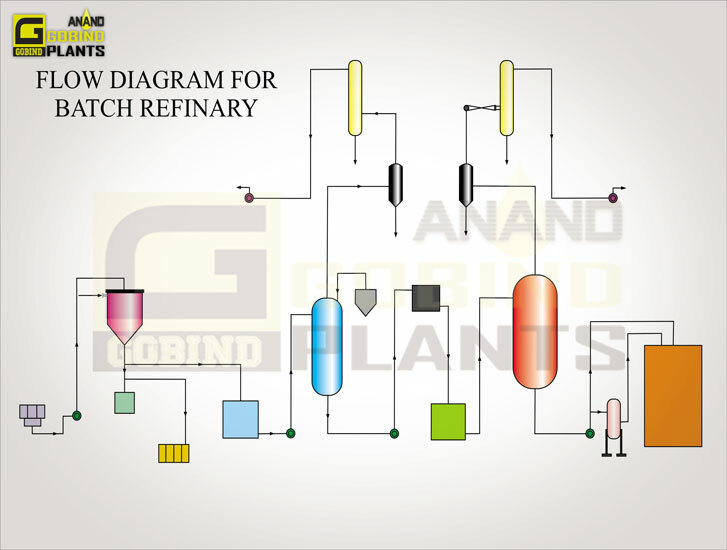 Batch process involves low capital investment, simplicity of operation and low maintenance, making refining economically a viable proposition even at capacity as low as 2.5tonnes per 24 hours. The equipment involved are Neutralizer/Degummer, Bleacher, Deodorizer, Heat Exchanger, High & Low Vacuum equipment & Filters. GOBIND plants with batch process have been operating at number of places, processing variety of vegetable oils. The refining of FATS and OILS is comprised of Water Degumming, Gum Conditioning, Alkali refining and Water wash. There are few choices to choose; short/long mixed process with Degumming or Gum Conditioning. FATS and OILS having gums and FFA (Free Fatty Acid) are required to be removed by Degumming & Refining process to produce quality refined oil. The OIL received from previous stages contains traces of soap, iron and few ppm of PHOSPHOLIPIDS and CAROTENES, these contents are undesirable and required to be removed in Bleaching Operation, GOBIND's bleaching machines includes STEAM AGITATED bleacher comprises of an acid treatment, a separate OIL and EARTH mixing DEVICE with MECHANICAL MIXER (this arrangement ensures no carryover of bleaching earth into vacuum system), main bleaching vessel and Hermetic filters. Our bleaching plants require less maintenance and provide effective bleaching operations. GOBIND has designed a perfect Physical refining plant & physical deodorizing plant for different Oil and very high capacities & in operation since last many years. Strategically Designed, combination of tower and fatty acid scrubber, ensures practically no carryover of fatty acids into vacuum system. Physical Refining process in physical refining plant is used to remove Free Fatty Acid, using Steam Distillation method at moderate temperature and under high vacuum. It is followed by Deodorization and an extra Technical facility is added before deodorization for removal of free fatty acid. Deodorization process in physical deodorization plant is used to remove unacceptable odour by Steam Distillation, the Odoriferous Compound are stripped off with the help of live injected steam into heated oil under high vacuum. A very simple requirement of this process is to produce CLEAR, BRILLIANT refined oil to meet certain specifications of CLOUD POINT. GOBIND offers a Perfect and Highly Effective Crystallization and Filtration process. It is composed of Homogenizer, Crystallizer and SELF CLEANING FILTER EQUIPMENT with SEQUENTIAL COOLING system. GOBIND has developed a perfect dynamic coil Designed Crystallizer for Guaranteed 100% Uniform Cooling specially for Rice Bran Oil, Sunflower Oil & Palm Oil and is already in operation with our valued client for highest quality of product. We also supply low budget crystallizer. SELF CLEANING FILTER EQUIPMENT is also a Latest Design, having the facility of Maintaining Filtration Temperature and is not affected by Ambient Temperature.